When looking for car computer repair in Covina, you are going to want to be sure that you are getting service from a team with ample skill, experience, training, and dedication. Thankfully, the team at Johnny’s Auto Service has you covered. There are many reasons why searching “car computer repair near me” well result in Johnny’s Auto Service is at the very top, and one of the biggest is the fact that we have a team of technicians with unparalleled expertise and dedication in their field. No matter how small or large the problem, our experts will provide you with seamless repairs alongside unmatched customer service. Auto computer repair is a service that many vehicle owners tend to overlook, but it is an extremely practical and cost-effective way to help ensure that your vehicle continues to run smoothly. Much like your desktop computer or phone, most modern cars have regular updates issued in order to fix certain issues, thereby improving performance as well as important safety standards. 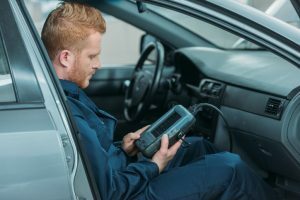 When you consider all the functions that a car’s computer is responsible for, it becomes more and more apparent why it is so important, and why you should bring it in for routine maintenance and repairs. If you want to get the best car computer repair service in Covina in order to guarantee that you continue to have a smooth and safe driving experience, then be sure to give us a call at (626) 966-5212 and we will be happy to help you schedule an appointment. Our team of ASE Certified Technicians will take care of whatever issue has been plaguing you and your car in no time!